It was the time when I was going home, as in my mother's home. Sometimes, I feel sad when people tell me that after marriage my mother's home is not my home anymore. But, how could I just stop saying or believing that home, where I lived so long, where I took my first breath, my first steps, spoke my first words, made my first friends and the place that gave me comfort for more than 21 years of my life when I knew nothing would go wrong as long as I am here. I certainly believe in calling my hubby's home "my home" as I am making this home with tender love and care for the people who will be there with me for the rest of my life. But still, my mother's home will always be my first home. I know it became too sentimental, this topic is very touchy for every Indian girl I think, who loves her family. Okay, so when I was going to my 'first home', I got a last minute request from my younger brothers to bring some of my delights, especially brownies, as both of them are die hard chocoholics. I just had a couple of hours and had to pack my bags (yeah, I do everything at the last minute!!!) and make some brownies before I left to catch the train. Please spare me for the poor quality of the photos here as the pics were taken at night and in great hurry. Heat oven to 350°F. Grease a 13x9x3-inch baking pan with butter or line it with a parchment paper leaving some extra paper from the sides so that its easy to take out the brownies when they are done. Place butter in large microwave-safe bowl. Microwave at HIGH for 2 to 2-1/2 minutes or until melted. Stir in sugar and vanilla and whisk for 2 minutes until well blended. Add eggs, one at a time, beating well with a whisk after each addition. Add cocoa; beat until well blended. Add flour, baking powder and salt; beat well. Stir in nuts, if desired. Pour batter into the prepared pan and level the batter using an offset spatula. Bake for about 30 to 35 minutes or until brownies begin to pull away from sides of pan. Cool completely in pan on wire rack. Cut into bars. I dusted snowy icing sugar over my brownies. Optionally, you can frost the brownies with chocolate ganache. 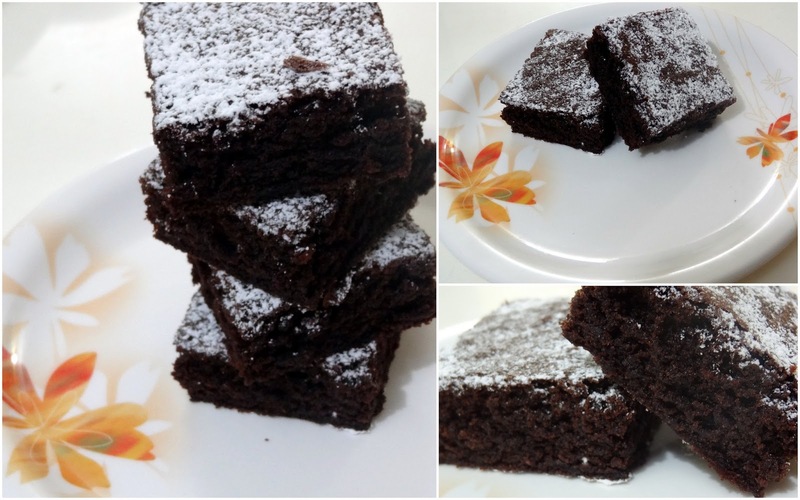 Hope you would enjoy making these brownies as much as I did! The Best Eggless Chocolate Truffle Cake Ever!! !